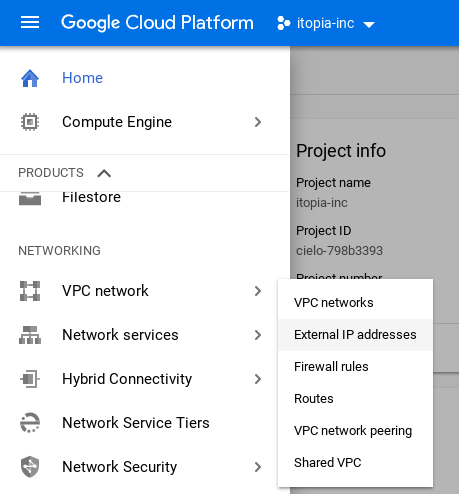 When ever you delete a project or a server from CAS or GCP, Google doesn't clear the static IP's that belonged to those servers. They need to be manually released otherwise Google keeps charging for them. To release the Static IP's first log into GCP. Select the three lines on the top left for the navigation menu, then browse to VPC Network> External IP Addresses. You can also click here to jump there. Once there, find the IP you'll want to release and check it off, and hit "Release Static Address" at the top of the page. You'll only be able to use this option as long as you see "NONE" in the "In use by" column. If you see that the IP is being used by something, it will be stated in the "In use by" column, and the object's name will be clickable so you can navigate to it's settings and either change it or delete the object.